Make your music louder and heavier with the only hard rock and metal drum loops up to the task. 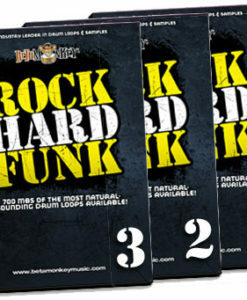 Looking for the real deal in hard rock and metal drum loops? Buy our two latest head-pounding metal and hard rock drum sample collections together and get the powerful drum tracks you deserve. The Power Metal and Hard Rock Combo Pack puts the power of Double Bass Mania VII and Drum Werks II: Reloaded together for only $59.99. That’s over 2GB of loops and samples for one low price. 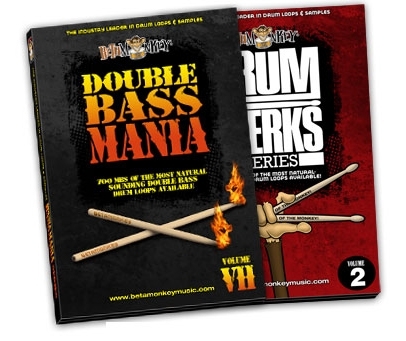 With 600+ (750+ MB) modern metal drum loops, Double Bass Mania VII covers a wide spectrum of modern metal drumming from 80 bpm to 110 bpm, drawing inspiration from modern metal styles as well as traditional death and thrash genres. Blasts, straight-ahead power grooves, half-time breakdowns, double-time blastbeats and skanks, Double Bass Mania VII will satisfy your thirst for pure modern metal drum tracks – a powerful resource for guitarists and songwriters whose influences range from classic thrash metal to modern metal hybrid styles. 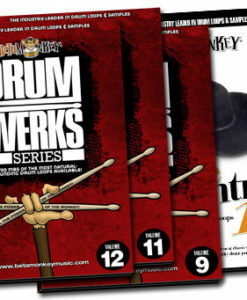 With 600 hard rock drum loops covering essential rock drum styles from 90 bpm to 150 bpm, Drum Werks II Reloaded covers the hard rock genre exhaustively with main grooves, half-time and double-time groove variations, and fills. 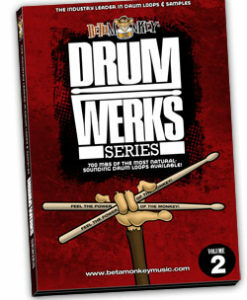 Drum Werks II: Reloaded captures the intense energy and power of hard rock and gives you a powerful songwriting tool to create rock drum tracks quickly and easily. This drum loop library will become your go-to songwriting tool for creating the heaviest and loudest hard rock drum tracks. With hundreds of the most brutal grooves to sledgehammer your hard rock and metal drum tracks, you get a complete matching multi-velocity drum and cymbal sample collection to give you an extremely flexible and versatile metal songwriting resource. Sequence the loops, build metal drum tracks from scratch with the samples, or sample enhance existing live drum tracks, the only limitation is your imagination. In a sea of pretenders, these are the real deal for all styles of heavy and aggressive music. It’s a slamming drum mix that will slam your songwriting into the next level. Loud. Aggressive. Powerful. That is what metal and hard rock drumming is all about. This powerhouse metal drum loops and metal drum samples package will satiate your thirst for the powerful drums your music demands. If you’re a metal guitarist, bassist, or songwriter, this is a wealth of metal and hard rock songwriting inspiration with a sound that will slay whatever you think you can throw at it. This pack takes you back to the beginning of early thrash! Back when those four horsemen started the scene. The loops are just as inspiring today!